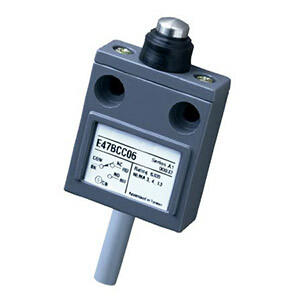 The E47 Compact Prewired Limit Switch is designed to be a versatile, slim device for hard to fit applications where sealing integrity is required. The rugged die cast aluminum alloy housing, cable connection and switch mechanism are encapsulated for protection against extreme temperature (-10 to 70°C), contaminants, moisture, shock and vibration. This factory wired (3 m) device has NEMA enclosure ratings of 4, 6 and 13, making it suitable for applications such as machine tool, food processing and packaging.